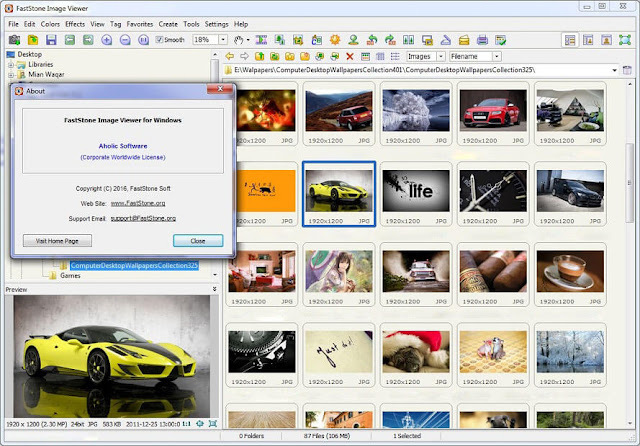 FastStone Image Viewer – A fast, stable and user-friendly image browser, converter and editor. The application has a nice array of features, which include image viewing, management, comparison, red-eye removal, emailing, resizing, cropping and color adjustments. FastStone Image Viewer is both innovative and intuitive. The application has a full-screen mode that provides quick access to EXIF information, thumbnail browser and major functionalities via hidden toolbars, which pop up when your mouse touches the four edges of the screen. Other features include a high quality magnifier and a musical slideshow with 150+ transitional effects, as well as lossless JPEG transitions, drop shadow effects, image annotation, scanner support, histogram and much more. It supports all major graphic formats (BMP, JPEG, JPEG 2000, animated GIF, PNG, PCX, PSD, EPS, TIFF, WMF, ICO and TGA) and popular digital camera RAW formats (CRW, CR2, NEF, PEF, RAF, MRW, ORF, SRF, ARW, SR2, RW2 and DNG). In addition to that, FastStone Image Viewer supports file tagging, creating and organizing favorites, building or splitting files with multiple pages of images (in PDF, TIFF or animated GIF), batch-converting images to other formats, and more. Image browser and viewer with a familiar Windows Explorer-like user interface. True Full Screen viewer with image zoom support and unique fly-out menu panels. Crystal-clear and customizable one-click image magnifier. Superior Red-Eye effect removal/reduction with completely natural looking end result. Image modification tools: Resize/re-sample, rotate/flip, crop, sharpen/blur, brightness/contrast, etc. Image color effects: gray scale, sepia, negative, Red/Green/Blue adjustment. Image special effects: watermark, annotation, drop shadow, framing, bump map, lens, morph, waves. One-touch best fit/actual size image display support. Image management, including tagging capability and Copy To/Move To Folder support. Histogram display with color counter feature. Image EXIF metadata support (plus comment editing for JPEGs). Configurable batch processing to convert/rename large or small collections of images. Slideshow creation with 150 transition effects and music support (MP3, WMA, WAV…). Create efficient image attachment(s) for emailing to family and friends. Print images with full page-layout control. Choose and set desktop wallpaper from your image collections. Acquire images from a scanner. Powerful Save As interface to compare image quality and control generated file size. Run favorite programs with one keystroke from within Image Viewer.